Home > Departments > Faculty > Odile Ferly Ph.D.
Dr. Ferly received a B.A. from the University of Bristol, UK, an M.A. from the Université de la Sorbonne Nouvelle, Paris, and a Ph.D. from the University of Bristol. She has been at Clark since 2004 and is affiliated with the programs in Communication and Culture, Race and Ethnic Relations, and Women's and Gender Studies. Dr. Ferly's research interests are Caribbean literatures and cultures from a comparative perspective, including the Anglophone, Francophone, and Hispanic regions. Her book A Poetics of Relation: Caribbean Women Writing at the Millennium (2012) examines contemporary women's writing from the Caribbean and its diaspora, focusing on the issues of race and gender in connection with history, language, and the Caribbean literary tradition. 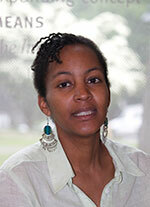 Her current research focus is on cultural politics in the French Caribbean. She teaches interdisciplinary courses on literatures and cultures from Francophone countries, on French popular culture, immigration in France and on Caribbean writing from a comparative perspective. "A Poetics of Relation: Caribbean Women Writing at the Millennium", New York: Palgrave Macmillan, 2012. "Defying Binarism: Cross-dressing and Transdressing in Mayra Santos Febres's Sirena Selena vestida de pena and Rita Indiana Hernández's La estrategia de Chochueca," in The Cross-Dressed Caribbean: Writing, Politics, Sexualities, ed. M. C Fumagalli, B. Ledent, and R. del Valle Alcalá, University of Virginia Press, 2013, 239-252. "The Mirror That We Don't Want: Literary Confrontations Between Haitians and Guadeloupeans", in Haiti and the Diaspora in the Wider Caribbean, ed. Ph. Zacair, University Press of Florida, 2010, 58-81. "La pluralit é comme gage de coh érence : m étissage et antillanit é dans L'autre qui danse", in M étissages et marronnages dans l'oeuvre de Suzanne Dracius, ed. Y. Helm, Paris: L'Harmattan, 2009, 225-239. "A Limited Caribbeanness? The Continental Caribbean as Visions of Hell in Alejo Carpentier's 'El siglo de las luces' and Maryse Cond é's 'La vie sc él érate'", Caribbean Quaterly, vol. 55, No. 1, March 2009, 43-59. "La historici(u)dad en 'Invi's Paradise', de Aurora Arias", MaComère (The Journal of the Association of Caribbean Women Writers and Scholars), No. 7 (2006), ed. H. Simpson, 66-76. "Women and History-Making in Literature from the Hispanic and Francophone Caribbean", in Swinging Her Breasts at History: Language, Body and the Caribbean Woman's Text, ed. M. Inghilleri, London: Mango Publishing, 2006, 30-46. "Writing Cultural and Gender Difference: Sylviane Telchid's 'Throvia de la Dominique'", in New Readings Vol. 7, electronic journal ed. by K. Jones and J. Sayner, University of Cardiff, UK, 2004, ISSN No. 1359-7485. "Neither Here Nor There: The Homeland in Diaspora Women Writers from the Hispanic and Francophone Caribbean", in Caribbean Women Writers and Interculturality, ed. by Giovanna Covi, University of Trento, Italy, 2003, 31-54. "The Fanonian Theory of Violence in Women's Fiction from the Caribbean", in Convergences and Interferences: Newness in Intercultural Practices, ed. K. Gyssels and I. Hoving, Amsterdam: Rodopi, 2001, 107-119.